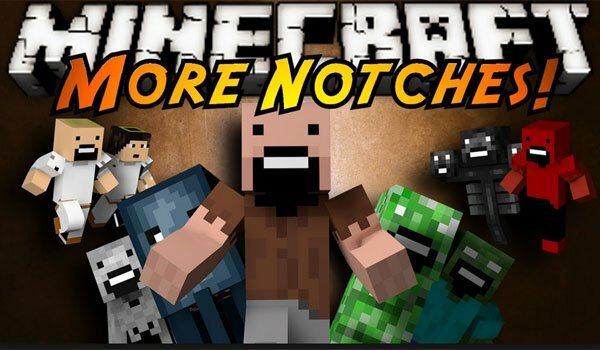 More Notches Mod 1.6.2 and 1.5.2 is a mod that adds to your Minecraft up to 15 Notches! So wandering around the world you will find the following kinds: Slender Notch, Notch Creeper, Hell Notch, Notch Zombie, Ghost Notch, Notch Butter, Shaved Notch, Friendly Notch, Notch Skeleton, Wither Notch, Notch God, Angel, Hell Creeper , Hell Spider, Giant Notch, Herobrine, Notch and Corrupted Squid Angel. Several of them have special abilities which you must be careful. For example, Slender Notch will give you blindness between other effects and Butter Notch will defend you from your enemies. But be carefully because many others have unexpected skills. Discover, yourself, other effects may have these Notches on you. This is not all, this mod also adds 8 new swords, two new dimensions and new objects. How to install More Notches Mod for Minecraft 1.6.2? How to install More Notches Mod for Minecraft 1.5.2?